Four powerful 40w 2.5' speakers brings 360°surround immersive audio experience. Music, movie and night, three kind of sound effects suits different demands and scenarios. Both bass and treble can be adjusted independently as your wish. Clear and stereo sound with high - end digital audio processing technology, also enhance the sound impact. This item supports four connection ways and shows different mode in colorful LED indicator. Dual wire(aux, optical), and wireless (bluetooth) installation. Support Samsung, TCL, LG, Sharp, Philips, Sony and many more TVs. 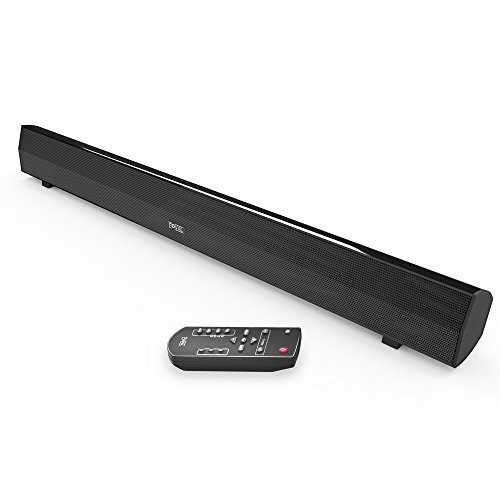 Adjust volume, bass, treble and select the sound effects, choose the signal source all via the durable remote control. Operate this item easily and conveniently. Built a home theatre with this exquisite and modern soundbar. High-quality audio enjoyment with four 2.5" 40w powerful speakers. While two covers the full audio spectrum, the other two specialize in the mid-low frequencies in order to bring out the bass for immersive audio experience. Make your home easily become a home theatre. Easy to control Set this item in different mode you like via remote control，four LED indicators shine in matching function, directly and identifiable. Adjust bass, volume and sound effects through remote control. Various connection way Pair via Bluetooth from up to 33 ft / 10 m or connect with the in-unit 3.5 mm, RCA, and optical inputs. Special design Matches your TV and living room properly with the exquisite and attractive design. What you get Bluetooth Soundbar Speaker, Micro USB cable, 3.5mm audio cable,optical cable, user manual, 12-month warranty and friendly customer service.